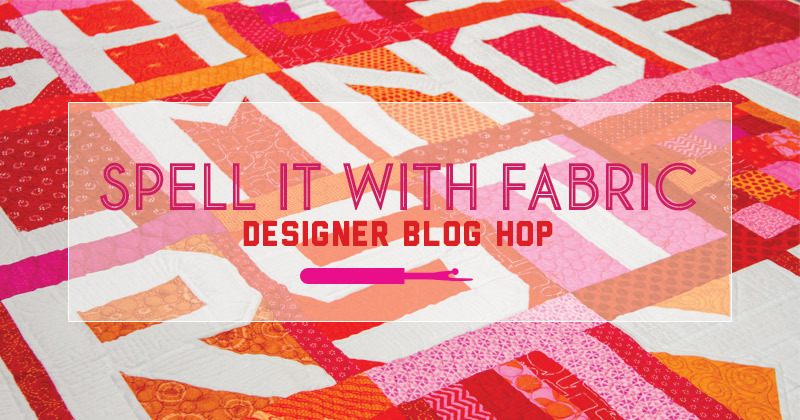 It seems so sad that today is the final day of the Spell it with Fabric blog hop. By now you have 26 letters, 9 numbers and some fun punctuation patterns. You have received some ideas on different things the designers did with their letters. Edyta put her daughters name on the back of the quilt with some of the letters. Bunny Hill appliqued on top of her pieced letter. Minick and Simpson appliqued their letter and made it into a zippered bag. Fig Tree pieced her letter using mini charms. Kathy Schmitz embroidered on her letter. French General turned her letter into a welcome banner. Me and My Sister crack me up with their post. special ABC quilt for the President of Moda. These are just a few of the ways the ABC patterns could be used. What was your favorite use of the letters? The finished ABC blocks measure 8 x 10 before adding sashing. Here are the instructions in case you missed them. The filler blocks are 8 x 8 so some spacers are added so they are the same size as the ABC’s. Use the filler blocks supplied here or create your own. Link here. The finished quilt as shown here measures 59 1/2″ x 68 1/2″. 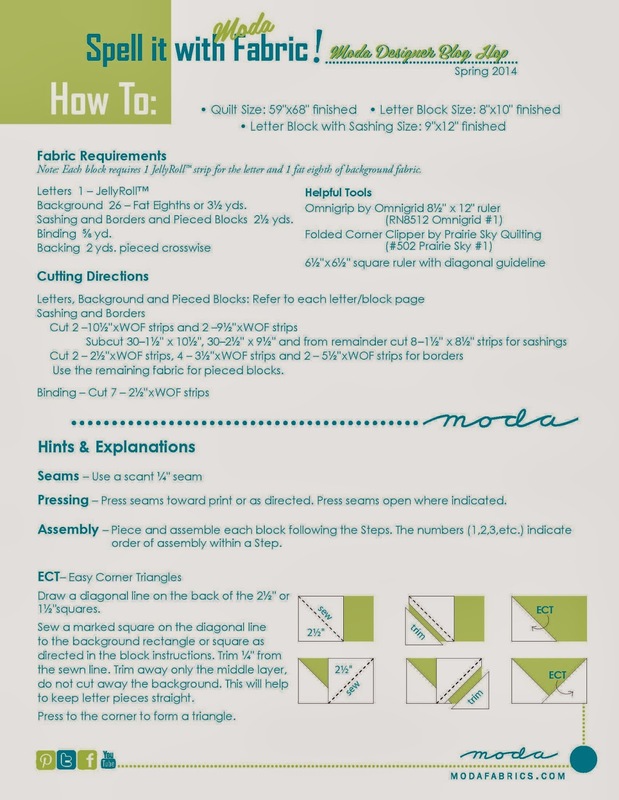 Download the final layout instructions, here. Are you sad the hop is over? No worries, the designers are already working on their next hop project. The Entire Moda team hope you enjoyed this project as much as we did creating it for you. Now is the time to circle back to each of the designers blogs where all the giveaways are announced. see if you were one of the lucky ones. We have 3 winners to post here. Congrats to SarahZ, you are the winner of an American Jane bundle. My favorite Shop is Hollyhill in West Linn, Or. I am lucky enough to live 40 mins away. This shop is beautiful. They have a GREAT holidays work shop in Nov. Bundle will be shipped april when this new collection arives. Thank you Lissa, and entire Moda team involved with Spell It With Fabric, It was lots of fun!!! Thanks for the blog hop. It was interesting and inspiring to meet the designers. I’m thinking hard about what to make using the letters. Great blog hop. all the posts were wonderful. Thanks Moda! Thank you Thank you so much!!! So many possibilities with these letters…it has been a super fun blog hop! 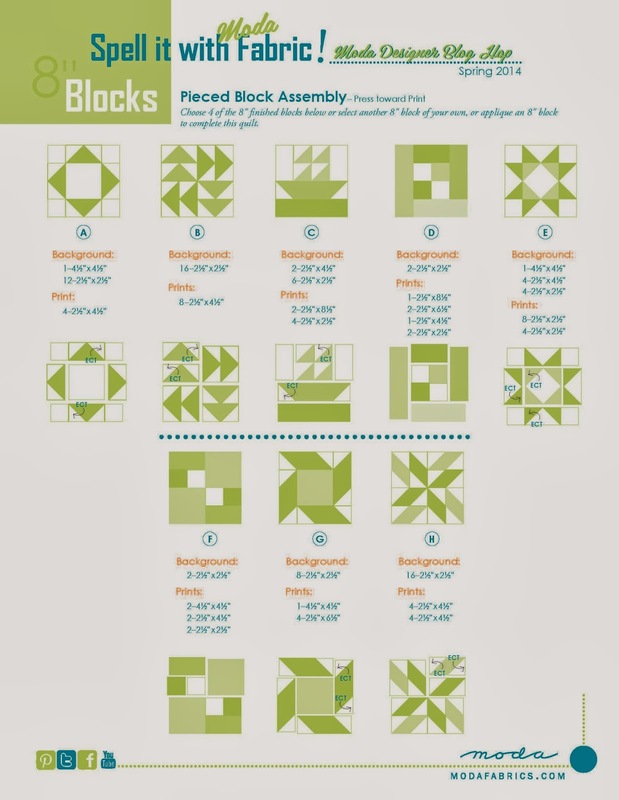 We are working on a post about reducing your blocks, stay tuned….. Ya I know. I was worried that the Abc’s would be limited but have no fear they all did a great job. Sandy gervais supplied a pattern for her wallhanging. https://www.dropbox.com/s/5g0gl1m8shqafek/UR_MYSUNSHINE.pdf and since the letters measure 8 x 10 finished you would just make the wallhanging as wide as how many letters used. Hers is 16″ wide since she used 2 letters, etc etc hope this helps. Thank you, this has been an amazing hop! Just want to say Thank you for all the fun Ideas. Cant wait for the next quilt a long. Thank you for this wonder Hop! It has been so much fun and very enjoyable!! Congrats to all the winners. I have had fun blog hopping, meeting new people and saving all those great letters, numbers and punctuation marks. This was such an awesome blog hop! 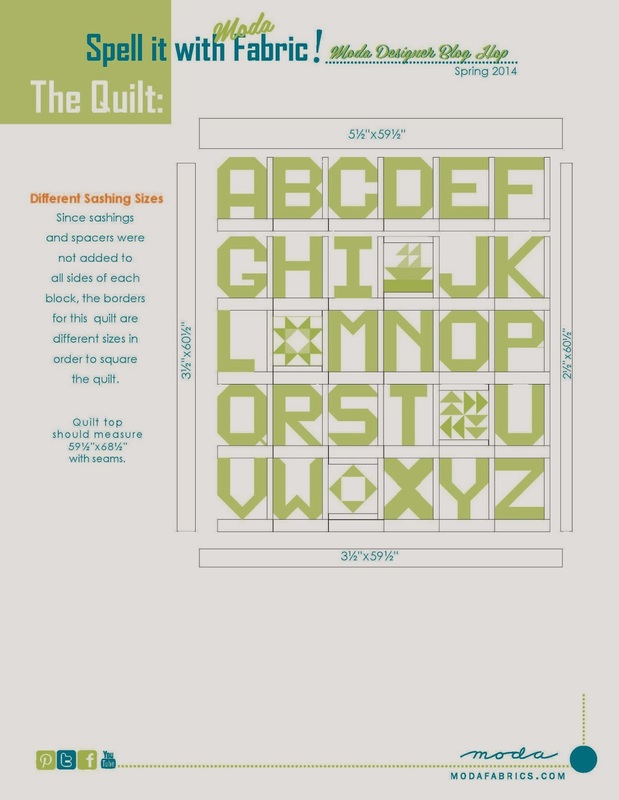 I loved it and can’t wait to try out the letters in my quilts! Thank you for the hop! I really enjoyed it and can’t wait for the next one! Is there another link to get the V pattern? I keep getting an error whenever \i click on her link. I was so surprised to see MY name. Can’t wait to get the gift. I have done a few blog hops over the years and have never won. This time I printed everything twice and am mailing everything a little at a time to my BFF in Idaho. Extending your blog for extra FUN. She should get her first envelope today. Thank You!! This was such a fun hop. Thanks for all the hard work and congrats to the winners! Congratulations to all the winners and many thanks to Moda for providing this blog hop and the prizes! What a fantastic hop! Thanks to everybody who contributed. But – I looked and looked again through all the posts, I can’t seem to find the R ;-( Can somebody help me out, please? Hi, I have all the letters but R. I was unable to find it. I think it should have been on the Moda blog. But the site has changed. I have a problem with R, too. Where is pattern? Awesome! Now I have them all. You will need to visit each blog in the list to download the instructions for each letter. If you need additional help locating a specific letter, please let us know what letter and we can direct you to the appropriate location. Have fun! It is Sheryl again. Anyone going to contact me for my address? I left Lissa an e-mail on Saturday. I started with alphabets a little late (they are SO neat) and I have been able to get all of them except Y (Barbara Brackman has taken it down) and I (I just can’t locate it on Basic Grey). Will someone please help. Thanks. I also started the alphabet late. I am trying to get the punctuation download. When I use the link on Gina Martin’s website, it is broken and leads to a Moda Home page that I don’t have permissions for. TIA. Yes, I’m late. Don’t know why or how, but I am. If I go back through all the blog posts can I still find the letters? I will do that if that’s what it takes. Thanks. Have all the posts been taken down? I would like them again. Especially W, T, B, C and P. Thank you! Hello All!!! We have just created a new Pinterest board for our Spell it With Fabric Letters for quick and easy access to each of the letters to create your own quilt. http://www.pinterest.com/modafabrics/spell-it-with-fabric/ HAVE FUN!